Long before the era of the Internet, humans already dreamt of creating the perfect search engine. 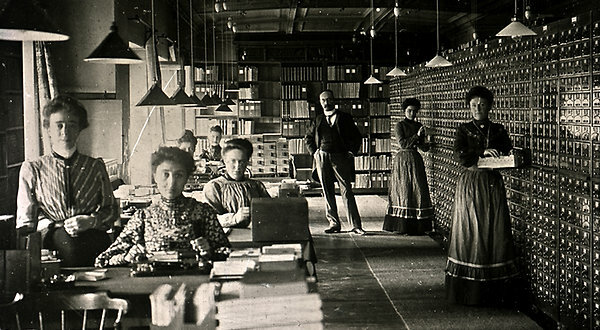 In 01895 two Belgian lawyers, Paul Otlet and Henri la Fontaine, began building their Universal Bibliographic Repertory: a card catalog similar to that of a library, but vastly larger. It aimed to classify all human knowledge and provide searchable links to books, newspapers, and other media. Otlet envisioned a whole “World City” of knowledge that would link libraries with museums and universities, and make information accessible to people across the globe. According to a recent NY Times article, Google has decided to pay homage to this pre-digital information network by announcing a partnership with the Mundaneum, the museum that grew out of Otlet and la Fontaine’s project. Located in Mons, Belgium, the museum now houses part of the Repertory’s archive, as well as rotating exhibits about knowledge accessibility and internationalization. From ancient Sumerian accounting, to Otlet’s City of Knowledge and now Wikipedia and Google, our knowledge webs have undergone quite a bit of evolution. Still, the motivations behind them have changed little with the passing of time. It seems that the desire to order our world into networks of information is a basic part of human nature; perhaps even a fundamental building block of civilization itself. It brings up the question: what will our search engines look like in 12,012?